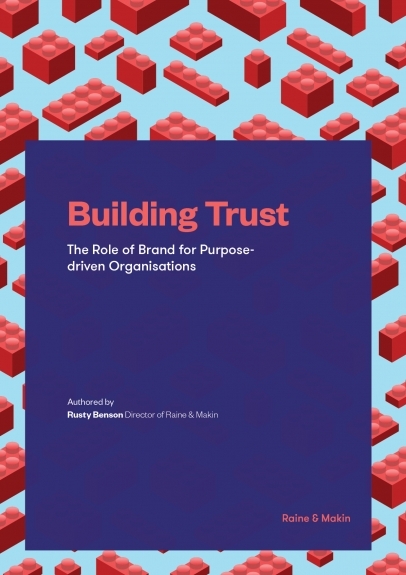 This eBook explores a framework for developing and maintaining purpose-driven brands. We look at the role that brand, identity, culture and behaviour play in earning and maintaining trust. Discover how to build trust through a brand driven by your values and purpose. Trust is key to every purpose-driven organisation. Organisations build and maintain trust by delivering on the promises they make to customers, partners and internal teams. In the case of not-for-profits and businesses set up to deliver social impact, delivering on your promises is key to your very existence. The word ‘brand’ or ‘branding’ provokes different, not always positive, responses from leaders of purpose-driven organisations. What place does brand have in our current climate? Can we use it as a force for good? If so, it is essential to provide clarity around the characteristics of a purpose-driven brand. We Already Have a Brand. A brand is far more than a set of defining visual characteristics, style guides, messaging, and marketing tactics. In the modern sense, it is the culmination of an organisation's culture, behaviour, communication and experiences people have with you. The Role of Brand in Purpose-driven Organisations. What Does a Contemporary Brand Look Like? Why is Brand Essential to Your Success?